In the past decade, the survival of extremely premature and sick newborns has increased staggeringly so as the iatrogenic issues. The most evaded one is radiation hazard. The inherent sensitivity of the newborns to radiation makes them vulnerable to the adverse outcomes which are not forthwith and manifest later. Lack of standardized protocol for radiological examination will also add to the quandary. Caregivers and the nursing staff are also at risk if adequate precautions are not taken. International Commission on Radiological Protection and Commission of the European Communities have formulated certain recommendations for employment of proper radiation techniques and safety measures. It also helps reduce the undue apprehension of the caregivers and medical staff about their risk from radiation. Introduction: The feeding of preterm neonates is one of the main challenges facing the neonatologist. Feeding intolerance can be defined by difficulty in ingestion or digestion of the milk that causes a disruption in the enteral feeding plan due to the manifestation of clinical symptoms. These symptoms include gastric residuals, emesis, abdominal distention, visible bowel loops, and change in the character of stool. Aim: To determine the incidence of feeding intolerance in preterm neonates. Methods: Study was carried out on 998 preterm neonates admitted at neonatal intensive care units of Port-Said in the period from 1st August 2014 till the 1st of March 2015. Inclusion criteria included Preterm infants of both genders from day 0 to day 28 of life and with gestational age from 28 to below 37 weeks (confirmed by maternal last menstrual period). Diagnosis of feeding intolerance depended on presence of one or more signs that leading to interruption of the enteral feeding regime of the preterm as; increased gastric residuals of the previous feeding, emesis, abdominal distention, bloody stool, diarrhea and visible bowel loops. Results: The incidence of feeding intolerance in preterm was 2.6%. Conclusion: The percentage of feeding intolerance in Port-Said, Egypt is 2.6% of the preterm neonate. Background and Objectives: Studies have shown that nutritional strategies instituted early in life will have a lifelong impact on mental and physical outcomes in neonates. The objective of the study is to compare two strategies for the advancement of enteral feeding in very low birth weight infants (VLBWIs). 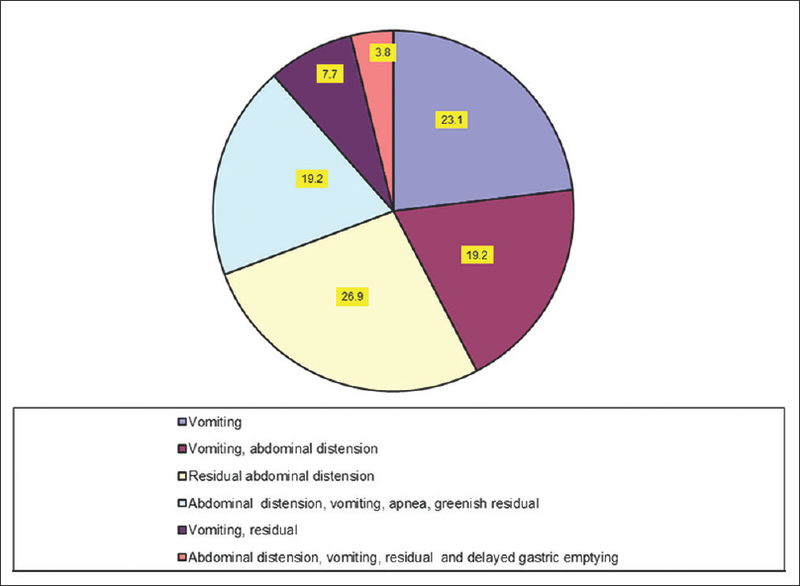 The primary outcome is the assessment of total days required to reach full enteral feeding without necrotizing enterocolitis (NEC). The weight gain at the end of the feeding protocol and the length of the hospital stay were recorded. Settings and Design: A prospective, randomized study of 101 VLBWI born or transferred to our institution for the period 2010–2014. Materials and Methods: One hundred and one infants enrolled, 85 infants (84.2%) completed the study and 16 infants (15.8%) either excluded or withdrawn from the study, 11 infants (10.9%) in frequency advancement (FA), and five infants (4.9%) in volume advancement (VA). FA, n = 38 infants (44.7%) started 8 hourly feeds and increased to every 3 h with increase in volume by only 10 ml/kg/day. Infants of VA n = 47 (55.3%) continued feeds at every 2 h interval; volume increased 20–25 ml/kg/day. Results: The two groups were comparable regarding gestational age, birth weight, and APGAR scores. 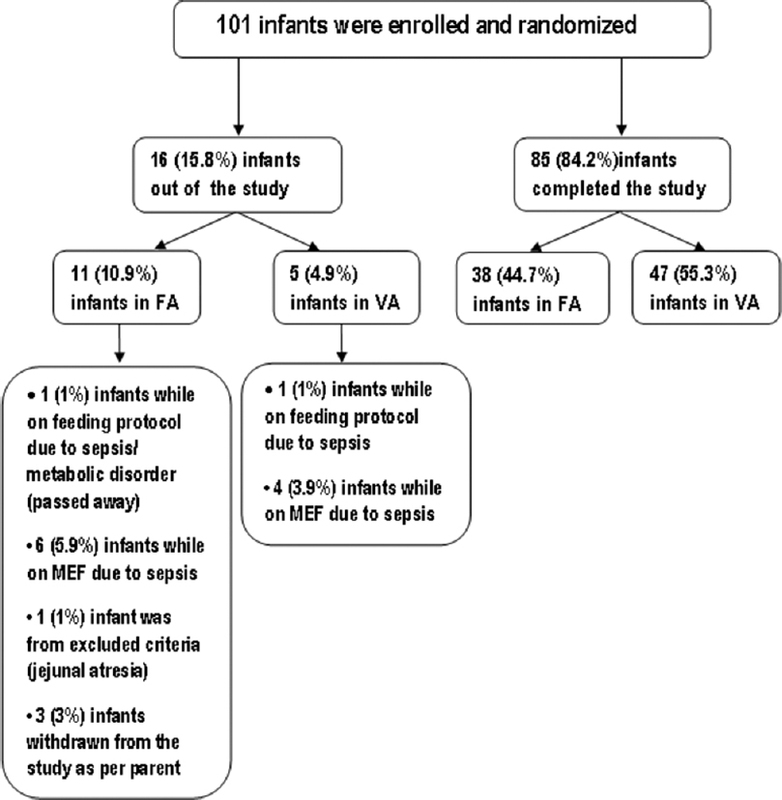 It was observed that the infants in VA reached full enteral intake without NEC earlier than FA with a difference of 12 days (P < 0.001), and a significant difference at the end of the protocol weight gain between the two groups was (1496 g for FA vs. 1281 g for VA; P = 0.001). There were no statistically significant differences in the length of hospital stay between the two groups (P = 0.221). Conclusions: Among VLBWI, an increase in enteral feeds by 20–25 ml/kg/day as in VA compared to FA protocol is a safe practice. VA of enteral feeding resulted in faster attainment of full enteral feed. However, there was no significant difference in weight gain at the end of feeding protocol and the length of hospital stay. Background and Objective: Correct interhospital transfer of neonates is an important factor in reducing their mortality. This study aimed at determining the prevalence and factors affecting the clinical complications of infants transferred to the Neonatal Intensive Care Unit of Besat Hospital within a year. Methodology: This cross-sectional study included all newborns transferred from the province cities to our center from October 2012 to September 2013 for 1 year. The clinical conditions were recorded during the transfer until arrival to the ward and the collected data were analyzed to determine the factors associated with clinical complications. Results: A total of 100 infants were enrolled in the study. The mean gestational age and the mean birth weight were 37.5 ± 1.8 weeks and 2800 ± 605 g, respectively. The reasons for neonate transfer were respiratory diseases (58%), need for surgery (21%), central nervous system diseases (9%), acute kidney injury (4%), fulminant sepsis (6%), and pathologic jaundice (2%). The mean time of transfer was 84 ± 42 min, being more than 120 min in 17% of the infants. Clinical complications occurred in 32% of the newborns with hypotension (18%) and hypothermia (9%) as the most common clinical complications and acidosis and hypercapnia as the most common laboratory abnormalities caused by transfer. Univariate analysis to evaluate the risk factors associated with complications revealed that gestational age of <37 weeks (preterm), mean birth weight, and intubation before transfer had a significant association with transfer complications. Conclusion: Interhospital transfer of neonates can increase the risk of complications, and since identification of infants requiring transfer is not possible before birth in all cases, it is necessary to develop an appropriate caring strategy and the transfer should be performed by an experienced team with adequate equipment. Background: Vitamin D deficiency in pregnant mothers is a widely recognized public health problem. Methods: A cross-sectional study of pregnant women who gave birth at King Abdulaziz University Hospital, Jeddah, Saudi Arabia, from January 1, 2015, to June 30, 2015, to determine the prevalence and potential risk factors of Vitamin D deficiency and to correlate maternal and cord blood Vitamin D levels. Results: A total of 201 mother–infant pairs were enrolled. There was a high prevalence of Vitamin D deficiency both in mothers (90.5%) and their infants (86%). There was no statistically significant difference in age, parity, body mass index, skin color, education, and employment status between mothers with deficient Vitamin D levels and those with Vitamin D levels > 50 nmol/L. 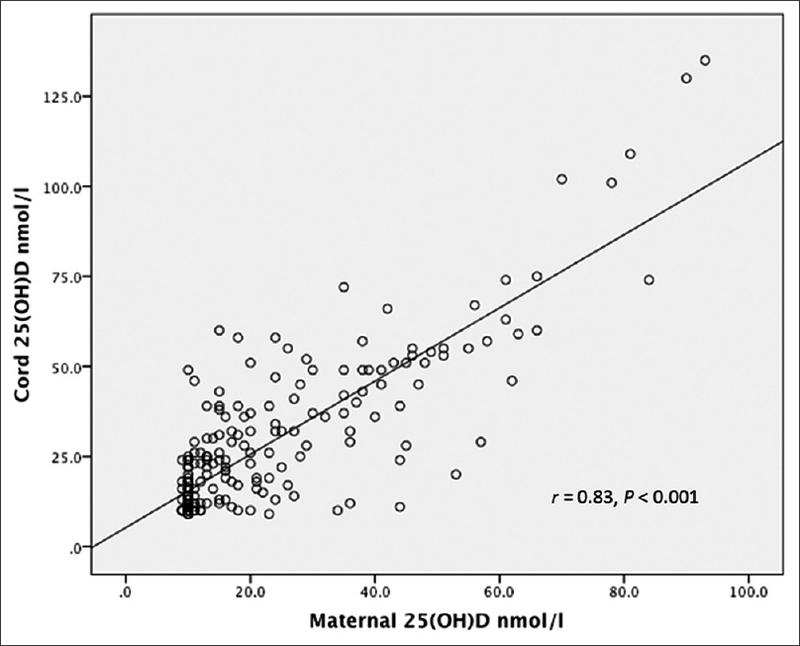 There was a statistically, significant positive correlation between maternal and cord blood Vitamin D levels (r = 0.83, P< 0.001). Conclusion: We demonstrated a high prevalence of Vitamin D deficiency in pregnant mothers, which was strongly correlated with cord blood Vitamin D levels. Clinical trials on the effect of supplementing Vitamin D to pregnant mothers and its effect on maternal and neonatal outcomes should be the focus of future research. Context: Neonatal sepsis is one of the common reasons for admission to neonatal units in developing countries. Resistance to antibiotics is increasing in neonatal sepsis. Aims: To evaluate the antibiotic resistant pattern of pathogens associated with early-onset and late-onset neonatal sepsis. Settings and Design: This cross-sectional study was done at special care baby unit of a tertiary care hospital from January 2008 to June 2009. Subjects and Methods: All neonates with risk factors or clinical features of sepsis were enrolled and samples for blood cultures were taken. Neonates whose blood culture yielded growth of bacteria were included in this study. Standard data collection form was used to collect all demographic data, pathogen, and resistant to antibiotics. Statistical Analysis Used: Chi-square test and Fisher's exact test were used for compare the variables. The value P< 0.05 was considered statistically significant. Statistical analysis was done using EpiInfo 7. Results: Sixty-five blood culture positive neonates were included in this study. Early-onset neonatal sepsis and late-onset neonatal sepsis were 35.4% and 54.6%, respectively, and 98.5% sepsis was caused by Gram-negative organism. Common organisms isolated were Klebsiella and Enterobacter. Organisms isolated were resistant to first- and second-line antibiotics and quinolone derivatives. In about 15% cases, bacteria showed resistance to third line of antibiotics used in neonatal sepsis. Conclusion: Gram-negative bacteria and in particular Klebsiella and Enterobacter species are the leading causes of early-onset and late-onset neonatal sepsis. All organisms were resistant to ampicillin, gentamicin, and third generation cephalosporin but resistant to imipenem and meropenem were low. Objective: The aim of this study was to determine the normal pre- and post-ductal arterial oxygen saturation (SpO2) immediately after birth in neonates born 200 m below sea level. Methods: A descriptive study was carried out, between January and December 2014, at the Pediatric Department of Moath Bin Jabal Hospital in the Jordan Valley. The arterial SpO2of the right hand and right foot of one-hundred neonates was recorded by pulse oximetry. Results: The mean preductal values at 2 min of life were significantly higher than the postductal values (P < 0.05). After 5, 10, and 15 min, the differences were statistically insignificant. At 20 min, there was no difference. The pre- and post-ductal SpO2rates of ≥95% were reached after 8 and 10 min of life, respectively. Conclusions: This study showed that it takes 8 and 10 min for healthy neonates, born below sea level, to reach pre- and post-ductal SpO2of ≥95%, respectively. 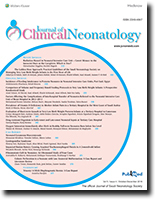 Neonatal cutaneous mucormycosis (NCM) is a rare, opportunistic, angioinvasive fungal infection with high mortality. 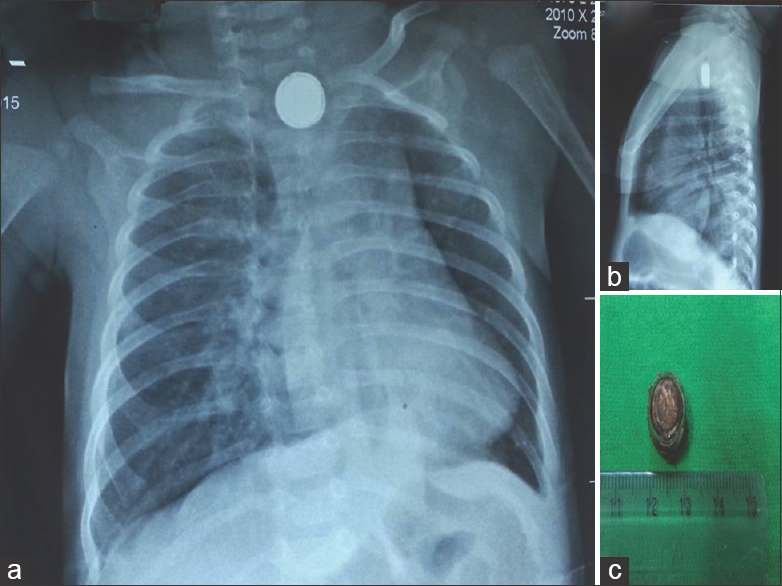 Here, we discuss the presentation, diagnosis, and management of a case of NCM where the neonate survived after 3 weeks of rigorous treatment with no need of local surgical debridement of the necrotic skin patch and systemic antifungals. This case highlights how early diagnosis and aggressive treatment are essential to manage this otherwise highly morbid disease. Genitopatellar syndrome is an extremely rare, autosomal dominant disorder characterized by the association of absent patellae, genital anomalies, dysmorphic features (coarse face, large nose, microcephaly), renal anomalies (multicystic kidneys or hydronephrosis), cardiac defects, and intellectual deficit. Constant skeletal manifestations include flexion deformities of the knees and hips with club feet. It is caused by mutations in KAT6B which encodes for histone acetyltransferase 6B enzyme involved in gene regulation. Fibromatosis colli is a benign swelling involving sternocleidomastoid muscle. It is usually seen in neonatal age group. The history of prolonged labor or difficult delivery may be present in many cases. 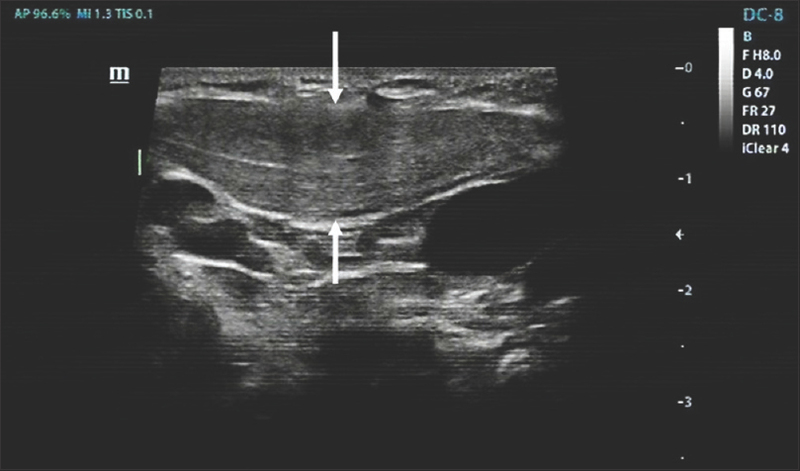 The presentation usually is asymptomatic neck swelling or mass in neonates. In some cases, torticollis may be present. The diagnosis is usually done by ultrasound which may typically show fusiform and thickened sternocleidomastoid muscle on the affected side. We hereby report four cases of fibromatosis colli presenting in the neonatal period. All of them presented with neck swelling and were diagnosed to be having fibromatosis colli on ultrasound. Anorectal malformation (ARM) is a common neonatal anomaly. Gastrointestinal perforation in a neonate with this anomaly is uncommon. Much rarer, there is a perforation complicating a low ARM with anocutaneous fistula discharging meconium and gas. We present a case of colonic perforation in a neonate with low ARM and an anocutaneous fistula.